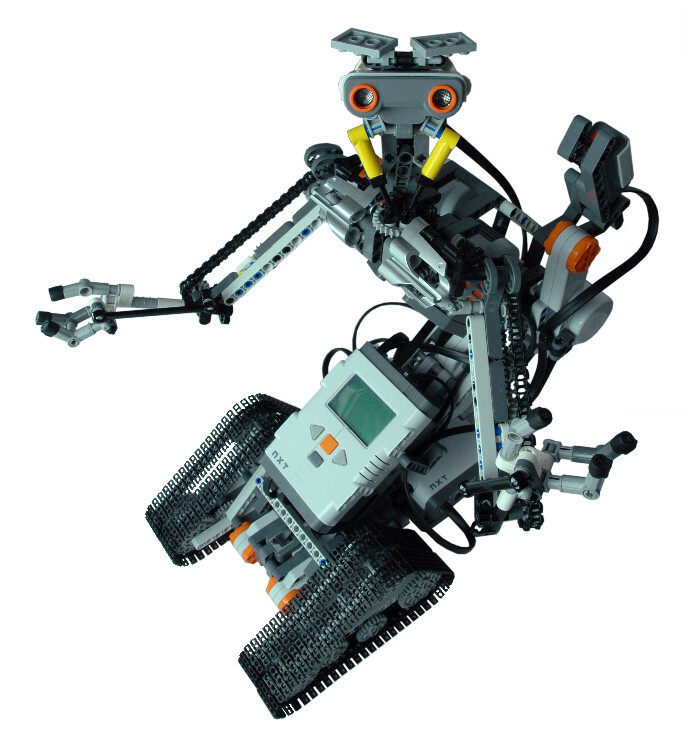 2008: JohnNXT is my LEGO MINDSTORMS NXT replica of Johnny 5, the robot star of the Short Circuit movies. 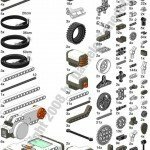 Its building and programming instructions are included in my first LEGO MINDSTORMS NXT book. 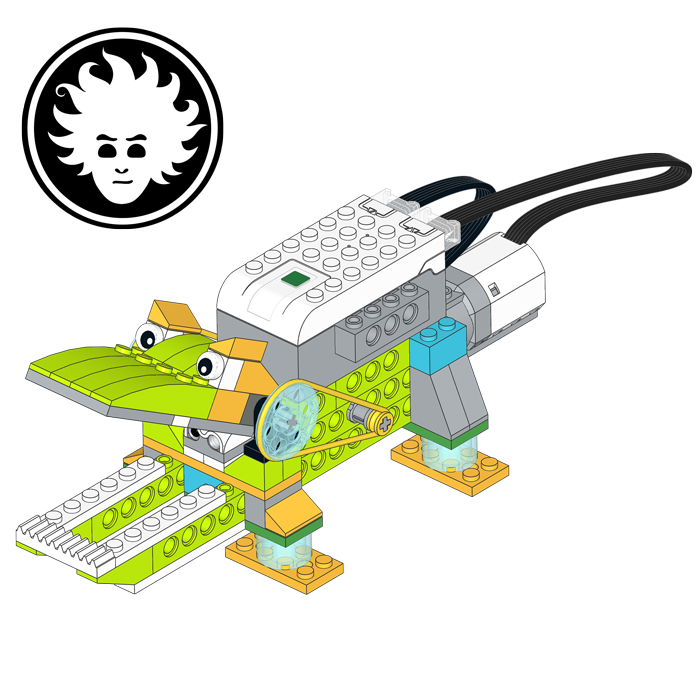 JohnNXT is an evolution of my first LEGO MINDSTORMS RCX Johnny 5. Even if you are too young to know Johnny 5, you will surely like my LEGO WALL-E! 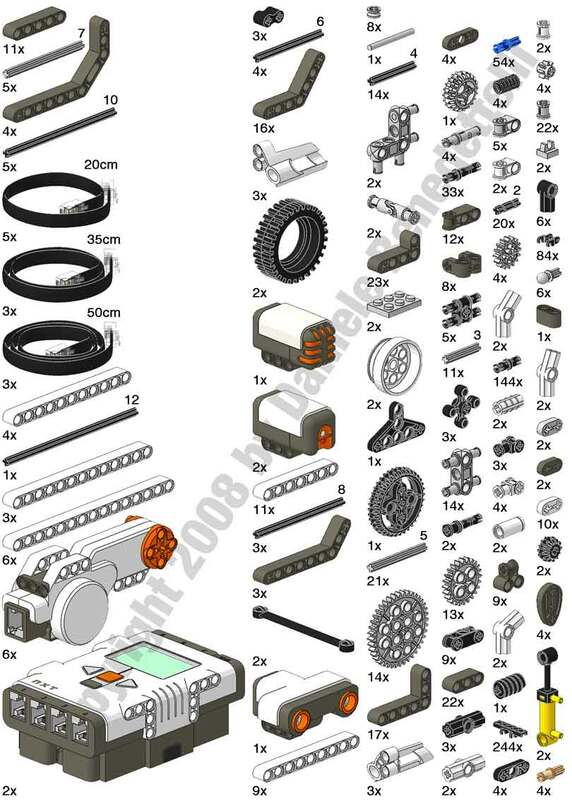 Check out the bill of materials to build JohnNXT. 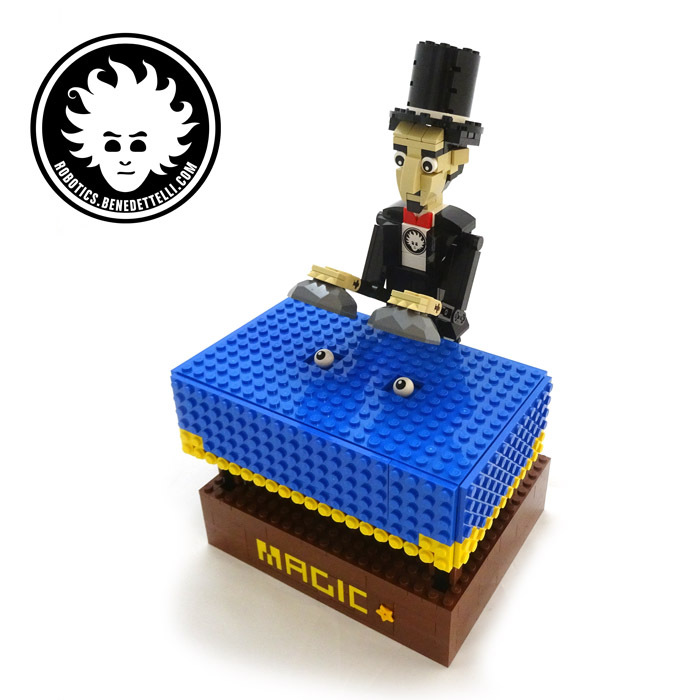 If you don’t have all those elements, you can build Mini JohnNXT instead. This Johnny 5 model has been built after dimensional study of real Johnny five to obtain the most precise replica possible in desktop scale. 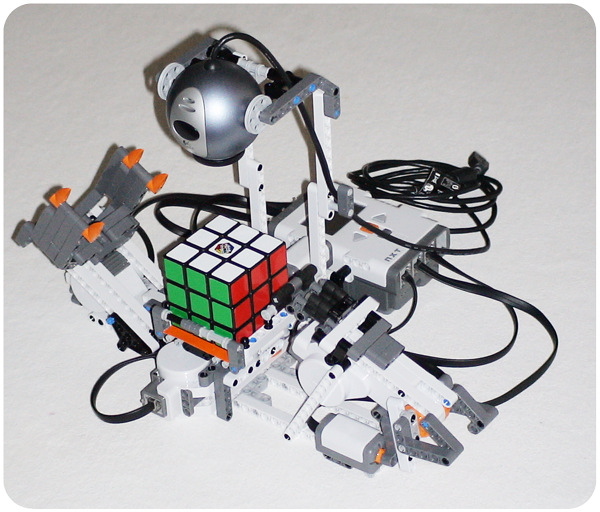 This model is driven by 6 NXT motors and can sense the world with 3 sensors (up to 8 sensors can be plugged). The two NXTs communicate with each other using the serial link on port 4. 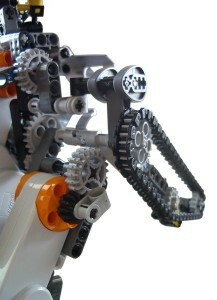 The gear ratio of the arms mechanism is 1:5. Two universal joints allow the shoulders to bend inwards and outwards. 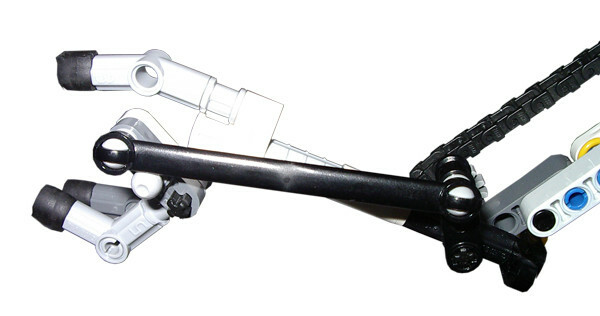 The arms motor, placed like this, seems the toolbox of Johnny 5. A parallel kinematic structure mantains the shoulders correctly aligned to the ground, when J5 torso is raised or lowered. 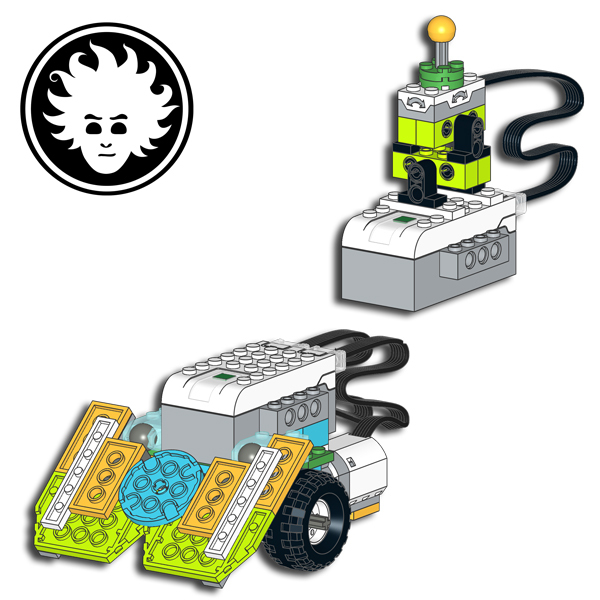 The triangular structure of the treads has been designed after precise studies of the real Johnny 5 photos. 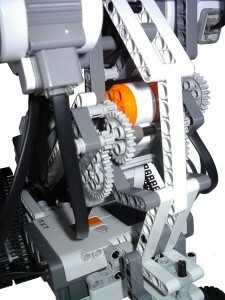 The Motors drive 40z gears by a couple of 24z gears, so that Johnny 5 can travel at a max speed of 10cm/s. The most stressed motor is the one that raises the torso. 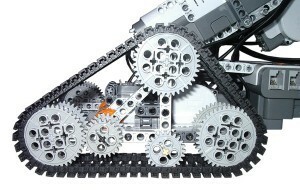 A powerful geartrain is needed to lift the upper frame, including 3 motors, the head, and the arms. The ratio is 8:24 x 8:40 = 1/15 so that the motor torque is powered by a 15 factor. In such cases symmetry is very important: otherwise gears could slip under this huge load. A chain trasmits the motion from the shoulder universal joint to the elbow. Here you can see the ball joint link that opens and closes the hand, and rotates the wrist. 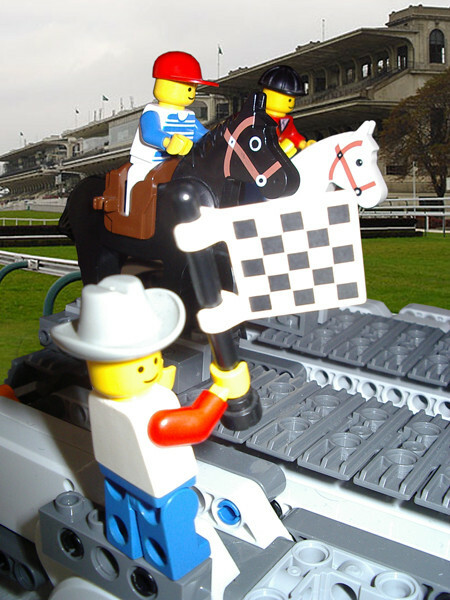 A rubber band is necessary to force the arm to come down before the hand opens. Some 2M rubber pieces have been cut to add some grip on finger tips.